Emirates Old Trafford's Hilton Garden Inn opened in September 2017 and was the final piece of the venue's multi-million pound redevelopment. The hotel boasts 150 bedrooms across five floors, with 85 overlooking the famous Lancashire Cricket pitch, a relaxing Garden Grille and Bar, residents' gym, business centre and over 700 car parking spaces. 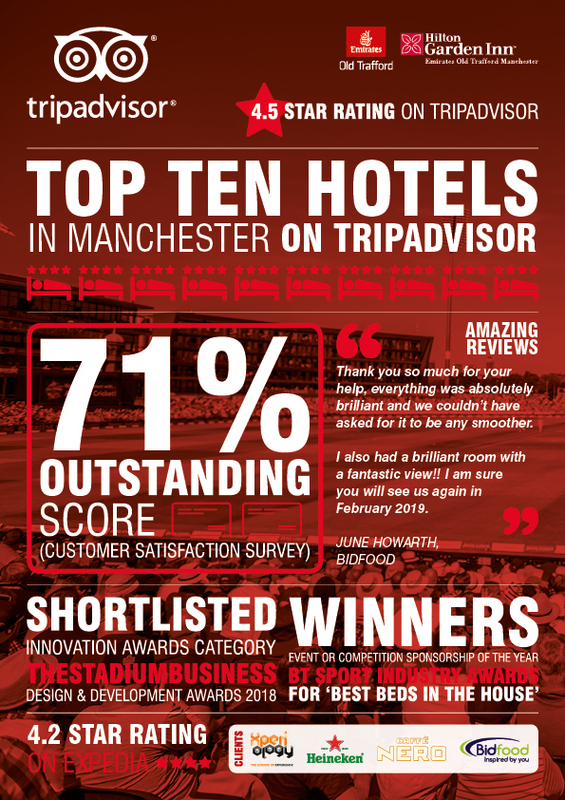 Since opening, the hotel has consistently been in the top 15 hotels in Manchester on TripAdvisor and recently we’ve moved in the top ten. Download our handy info-graphic here. To check dates, room availability and to book please visit the Hilton Garden Inn booking page, here. For conference and event hotel bookings, check out details here. To book a table at The Garden Grille and Bar, click here. If you would like to download our handy 'how to find us' map please click here. What would be the reason for your stay? Alternatively, to find out more about the Hilton Garden Inn Emirates Old Trafford Manchester or view our latest news, please click on the pages below. Hotel bookings now open for conference and events stays. Are you interested in a career in hotels or hospitality – click below to find out more. After a long day of travel, or a busy day at the office, relax with your favourite cocktail or cold craft beer in the Lounge before enjoying one of our mouth-watering dishes such as our black pudding and apple croquettes, tender braised ox cheek with buttered new potatoes, tender stem broccoli and red wine sauce, or opt for the more traditional beer-battered haddock and chips. At our Hilton Garden Inn, you’ll find an open, inviting atmosphere with warm, sunny service from the first hello to the next.